Do you crave to crusade? Does raining down hellfire in the name of The All Father and fallen brothers sound appealing to you? Join the adventure and help us purge the filth of the universe! The Warpath of a crusader is a sight to behold newcomer. - Grasp your ship and your shields and join the fight that never ends in our elite military ranks. Whatever you decide, we welcome you in open arms newcomer. A nice, new and shiny post. I look forward to seeing what this Organization can do. Thanks man! Looking forward to growing. Nice, proper thought into job descriptions, that has been rare for the longest time, looking forward to clashing with your military. 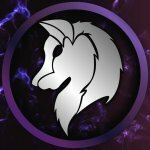 Welcome to the community and forums! Welcome, looks good, hope to see you in space. This images symbolic meaning is quite deep. First and foremost, you have the giant ring of a snake eating itself. -What does this mean? Is it related to the cycle of need rebuilding itself? -The snake is thought of a evil animal. Does this mean purging something brings it back stronger? -What if the snake is trying to kill itself in order to save society? -Is the snake actually defending society against itself? Or from the outside? The woman with the scales. -She is also holding a sword, and blindfolded. Does the suggest ruthlessness with no bias or is it where people repeatedly ignore (the quite literal) scales and harm to those who suggest what's right and wrong? -The woman is also facing the right. -It has no [literal] point. Are the "New Genesis" directionless, forging a path? Or is it simply being lost? -Hopefully your name, "TheMasterArchitect" is relating to measuring things to a precise level, which could indicate a totalitarian society or a perfect socialist community. -It is on the left, which assuming left to right, makes it most important. -That means society before rights, and rights before direction. Let's talk about the color blue. Why blue? -Is red thought as bloodlust and strong while blue is the opposite, indicating pacifism and knowledge? -Is blue thought of as water, which in some cultures is sacred? -Is blue chosen due to it's incredible difficulty to create in nature? 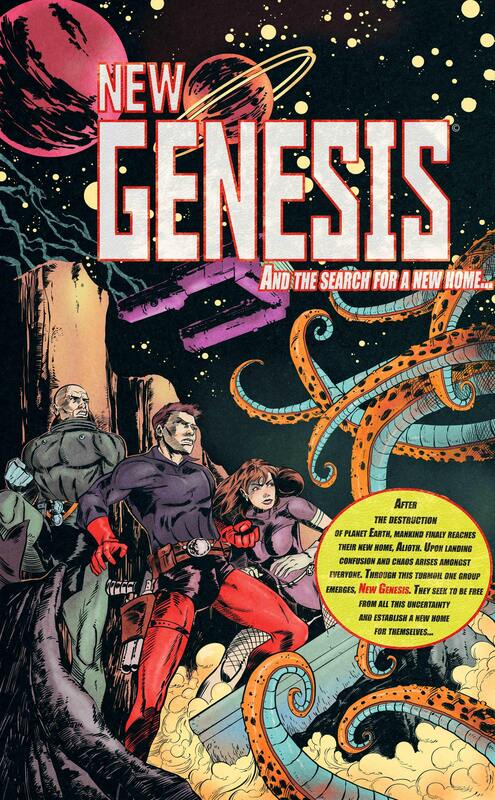 New Genesis: the name itself both makes all the sense... and no sense. -This double statement is strange. Genesis is thought of a borning, and a new born is thought to be, well, new. -Genesis, in it's denotative meaning, is the formation, creation, or upbringing of something, someone, or an idea. -New. New. Naming it Genesis would be far better due to the fact of it's simply a better name. Rolls off the tounge. This government system is a simply a dictatorship, where the High Council and Audit Agency are simply overrideable. Galactic Protection Agency is useless ultimately, as any self-respecting military would instead have a direct action route on the military. Ministries are quite a broad term there! Ministries should actually be above the white line of division of important. National Police Agency is redundant. Also, why is it not linked to military? Almost everything here should be able to enact on a Local Government. Civilian Population are treated as the bottom, which is bad for morale. Can't you think of a more happy way to phrase it like maybe put a few kittens there? I urge all readers actually interested to read the full description of the government and not just the layout presented. It's too long and complicated to post on here. For National Police Agency that is actually the local police. They bring peace and harmony domestically. My ambition is to have a large group and I know from my experience in the past is that not everyone in your group is on the same page. In my version our national police is combined with the FBI and homeland security, I thought it would be too complicated to have an FBI, Homeland Security, DoD & Police. Military doesn't do Police work in real life and neither does it do that here in my government. The Galactic Protection Agency is our version of the CIA. They gather intel, analyze, prevent sabotage, assassinations, etc. Just like the CIA would do in real life. I foresee a lot of politics in this game which is what I love doing so for that I have created a lot of departments to handle a lot of things. Please view the full description of the government in the link down here. Obviously you did not click it since you said "Ministries are quite a broad term there!". I actually go in depth in my document about each sector. It is also in my first post but obviously many will skip on it if they are not interested. This particular snake is called Ouroboros. Ouroboros symolizes eternity. Eternity for what? I like to think we have an eternal plight to ensure the prosperity of mankind. The woman with the scales is called "Lady Justice." The blindfold represents objectivity, in that justice is or should be meted out objectively, without fear or favour, regardless of money, wealth, power, or identity; blind justice and impartiality. In her left hand, Lady Justice holds balance scales, which represent the weighing of evidence. The square & compass combined is a symbol in freemasonry. It is an architect's tool. I am TheMasterArchitect and as such I have chosen that freemasonry symbol for this. An architect is a creator but for this particular instance in DU I am creating a society. I would like the Architect's importance to be up there. The actual compass represents navigation. I like the compass because for me it represents our governments plight to find a new home. Depending on your dictionary Genesis could have a multitude of meanings. It also means the mode of formation of something. After the catastrophe on earth in Dual Universe's lore we want to start again. I, one of the sleepers just like you, awoke from this catastrophe seeking to form a new society. I named it New Genesis in remembrance of our new beginnings. About the color. Firstly, I like blue. Therefore I chose blue. 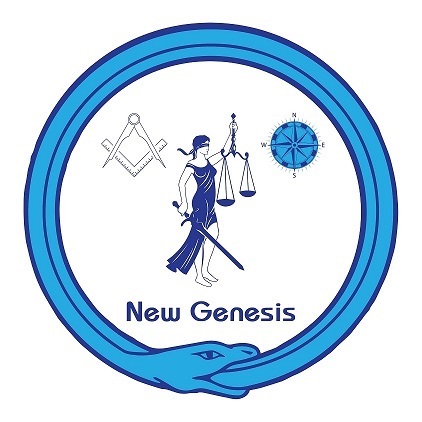 Secondly New Genesis is a peaceful form of government and we don't reign down on our enemies. Choosing "bloodlust" red wouldn't be right for us because as you said red is bloodlust and that just represents a nation of war, which we are not. Ah! It makes sense now! I thought the areas were specifically related to their real-life job, but it's actually logically structured (money is handled from the top instead of the middle, and there is actually an anti-terrorism unit)! Just read that document on the government outline and I must say, it's quite the work of art really. Nicely done. Great short talk today and glad to have you as our new Prime Minister! We have been added to the long list of organizations! Check out our page and apply! -The snake is thought of a evil animal. What else is evil? Cannibalism of course, and with this symbol, the snake clearly represents that the org will eat anyone inside alive, it wont commit cannibalism outside of its org, because it needs the peoples consent via joining. -She is also holding a sword, and blindfolded. So we can first automatically assume she is bling, and doesnt want to show her eyes which have already been eaten out by her org. Secondly, the sword, its just a way to symbolize they dont use surgical tools to cut away body pieces, they preffer the ancient ways of their ancestors. as for the scales, im sure it just represents that a members body is eaten evenly throughout the org so that people dont fight over body parts. Im 99% sure its jack sparrow's compass which shows you what you desire most, and most of the members desire to know who to eat next, and the fact we cant see the compass needle indicated that it is spinning wayyy too fast because the person who is to be eaten next is holding the compass. probably because the blood of the dead corpses looks more bluish than red. Right. What can this org provide that the others can't? Just saying, orgs have it backwards. They're out there advertising their awesomeness, but everyone knows their awesomeness doesn't even exist yet. Orgs need to start actively recruiting. Hey, hey you... we've been watching you, and we want you on our team. Ha I don't want to attack any other organizations. I'll just say different strokes for different folks. In our nation you can be everything from a spy to a politician to a night club owner. I believe we have a more complex government structure and I think that's what makes us stand out. Well I have been recruiting. I secured two positions today with people who are great for the job. A Prime Minister and our Military Councilor plus some who just want to be citizens. that is an enormous f'ing document. It will likely take me quite some time to consume it. That document is just a summary of job descriptions. Policy, constitution, laws and other things will be added later. Looking to get a website created next month where we can store all of our information. I feel like money will rule the new world. There is nothing that money can't overcome. I want to be allied with the richest org out there. My services, however meek, are always available to you because you are the most likely to pay me. Just sayin. Join our discord to discuss our trade policy.